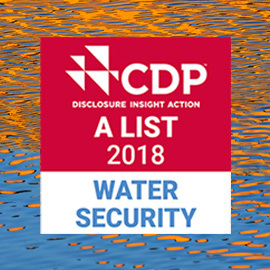 Ford Motor Company has received an A grade for its water security efforts from CDP, the environmental impact nonprofit that drives sustainable economies. Ford’s climate change efforts earned the company an A- for the third year in a row. KUALA LUMPUR, Malaysia, 31 January 2019 – Ford Motor Company is honored to receive an A grade for its water security efforts from CDP, the environmental impact nonprofit that drives sustainable economies. This marks the fourth year in a row Ford has earned an A from CDP for its water management efforts. Ford is one of fewer than 30 companies globally to be awarded an A for water security, in recognition of its efforts to manage water sustainably. Since 2000, the company has worked to conserve water through its global water initiative and has reduced operational water use by 62.5 percent, saving 10.4 billion gallons of water. Ford is on track to achieve its goal of reducing water use by nearly three-fourths by 2020, with a long-term goal of using zero drinkable water in its vehicle manufacturing processes. Ford received an A- for its climate change efforts for the third year in a row. As part of the company’s commitment to deliver on its share of CO2 reductions consistent with the Paris Climate Accord, Ford is investing $11 billion to introduce 16 fully electric vehicles within a global portfolio of 40 electrified vehicles through 2022. Additionally, in 2017 Ford achieved its goal to reduce the company’s global carbon dioxide emissions from manufacturing operations by 30 percent per vehicle produced by 2025, eight years early. Ford’s annual sustainability report has tracked the company’s comprehensive approach to managing corporate social responsibility issues related to climate change, water conservation and air quality among others, and has identified opportunities for significant impact across the business since 2000. To learn more about Ford’s sustainability performance, data and reporting, please visit sustainability.ford.com.